The first vote by a Senate committee is due over the nomination of Brett Kavanaugh to the US Supreme Court. It follows Thursday's testimony by Mr Kavanaugh and Christine Blasey Ford, who has accused him of sexual assault. 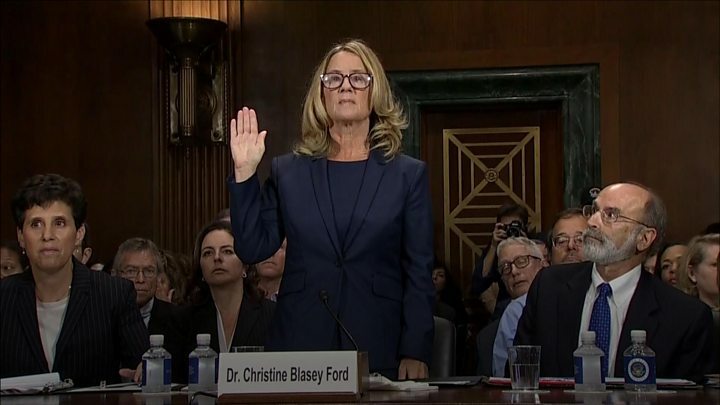 Dr Ford, close to tears, described the alleged 1982 attack in detail, saying it had "drastically" affected her life. Judge Kavanaugh angrily denied he had assaulted her or anyone. President Donald Trump has urged the full Senate to approve his nominee. That vote is expected next week. Republicans currently have a majority of 51-49 in the Senate, but a number of senators on both sides are said to be undecided. Judge Kavanaugh's appointment would tilt the balance in favour of conservatives for years to come. For this reason, Republicans accuse the Democrats of seeking to delay the confirmation until after the mid-term elections in November when they hope to win enough seats to stop it altogether. Democrats counter by accusing Republicans of trying to "railroad" the process. The Supreme Court plays a vital role in US political life - appointed for life, its nine members have the final say on US law. 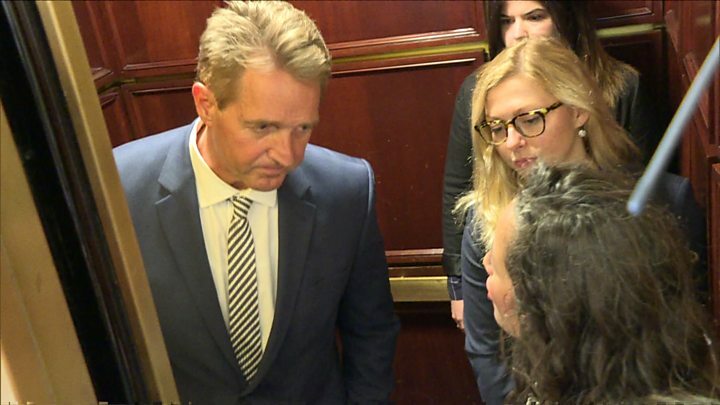 Republican Senator Jeff Flake, a member of the Senate Judiciary Committee who was believed to be wavering, issued a statement shortly before the committee began sitting on Friday morning stating that he would back Judge Kavanaugh. On his way to the committee room following the release of the statement, he was berated by two women who said they were victims of sexual violence and urged him to change his mind. 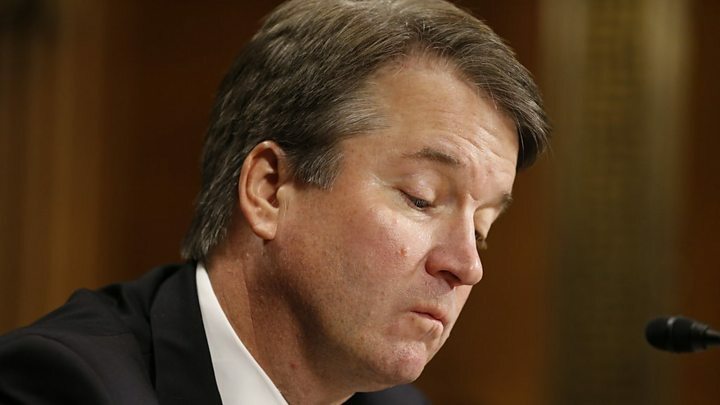 As the committee began, the bitter political divide was clear as an attempt by Democrats to call a further witness - Mark Judge, who Dr Ford said was present during the alleged sexual assault - was defeated by the 11 Republicans voting against the 10 Democrats. A subsequent motion to move to a vote on Judge Kavanaugh's nomination was passed despite vocal Democratic objections. Some Democratic senators refused to vote on that and walked out of the hearing. In a letter after Thursday's hearing, Robert Carlson, head of the American Bar Association - the body representing US lawyers and students of law - urged a delay of the vote to enable the FBI to check the allegations against Judge Kavanaugh. The association had previously supported Judge Kavanaugh for the role. What did Christine Blasey Ford say? Thursday's hearing, which lasted for nine hours, brought an outpouring of support for Dr Ford - a university professor - from the #MeToo movement against sexual harassment and assault. Prior to Thursday, no-one had heard from the 51-year-old publicly since the allegations arose. "I am here today not because I want to be," Dr Ford said. "I am terrified. I am here because I believe it is my civic duty to tell you what happened to me while Brett Kavanaugh and I were in high school." She alleged he and his friend Mark Judge had locked her in a bedroom during a small gathering at a house in a Washington DC suburb in the summer of 1982, when she was 15 and Judge Kavanaugh was 17. Dr Ford said Brett Kavanaugh had tried to remove her clothing, pinned her to a bed and groped her. Both men were "drunkenly laughing", she said. She added: "Brett's assault on me drastically altered my life. For a very long time, I was too afraid and ashamed to tell anyone the details." Under questioning by a Democratic senator, she said her most vivid memory was "the laughter between the two and their having fun at my expense... They were laughing with each other - two friends having a really good time with one another". In an answer to a question from another Democrat about claims of mistaken identity, Dr Ford said she was "100%" certain that Judge Kavanaugh had assaulted her. How did Brett Kavanaugh respond? The 53-year-old federal judge took a combative approach but occasionally became emotional. "This confirmation process has become a national disgrace," he told the committee. "The constitution gives the Senate an important role in the confirmation process, but you have replaced advice and consent with search and destroy. "Since my nomination in July there has been a frenzy on the left to come up with something, anything to block my confirmation." He insisted he would not be "intimidated" into withdrawing from the process. "You may defeat me in the final vote but you'll never get me to quit. Never." Judge Kavanaugh said he did not doubt that Prof Ford had been assaulted, but insisted: "I've never sexually assaulted Dr Ford - or anyone." He admitted he had drunk beer while at high school, but said he had never got so drunk as to forget events. He added that his calendars for 1982 - which he had kept - showed he had not attended a party at the location Prof Ford had described. The Democratic senators on the committee have called on President Trump to "immediately withdraw" Judge Kavanaugh's nomination. Moments after the hearing ended, however, President Trump tweeted that he was standing by his nominee and said he found Judge Kavanaugh's testimony "powerful, honest and riveting". Mr Trump has repeatedly defended the judge's character, saying he is "one of the highest quality people" he has ever met. Thousands of protesters against the nomination took to the streets on Thursday and 59 people were arrested near the Supreme Court in Washington, DC. The Senate Judiciary Committee vote on Judge Kavanaugh's confirmation could result in a recommendation that the candidate should be confirmed or rejected, or in no recommendation at all. After Friday's panel vote, the full Senate could start taking procedural votes at the weekend. A final vote by the full chamber could come as soon as Tuesday. Judge Kavanaugh denies these allegations, and on Thursday called Ms Swetnick's allegation "a joke" and "a farce".